inner edge of home plate (pz 2.712; px -1.018) while the first called strike was located belt high and over the outer half of home plate (pz 2.630; px 0.500), the call was incorrect. At the time of the ejection, the contest was tied, 1-1. The Blue Jays ultimately won the contest, 2-1. This is Sam Holbrook (34)'s sixth ejection of 2013. Sam Holbrook now has 10 points in the UEFL (12 + 2 + -4 = 10). Crew Chief Joe West now has 3 points in the UEFL's Crew Division (3 Previous + 0 Incorrect Call = 3). This is the 108th ejection of the 2013 MLB season. This is the Blue Jays' 9th ejection of 2013, 1st in the NL East (TOR 9; BOS 5; BAL, TB 4; NYY 2). This is Jose Bautista's 2nd ejection of 2013 and first since June 9, 2013 (Gary Darling; QOC = Correct). This is Sam Holbrook's first ejection since April 19, 2013 (B.J. Upton; QOC = Correct). Challenge -- 2/3rds of the entire at-bat was called correctly. The second called strike did not holistically change the at-bat. Do the Blue Jays have the most non brawl related ejections? At least they are winning something? Sorry, but that's not true at all. There's a huge difference between 1-2 and 2-1. At 2-1, he may not chase the outside slider/cutter because he doesn't have to protect, he'll let it go. Once you've put the pitcher ahead and with 2 strikes, it changes the at bat completely. Think of it this way, if you only have three errors at work before being fired, if the first one is incorrect and there's no appeal, oh well, you still have two to work with. If it's the second one, you only have one to work with, and they have already showed they may not make the correct decision, placing you firmly on your back foot. So this one is incorrect but the Ortiz ejection was correct? C'mon man! What exactly are you looking for? The computer numbers support both decisions and that's really all we have to go by - concrete numbers. The Board is asked to consider whether the argued call (Pitch #3/Strike 2), an incorrectly ruled strike, satisfies the requirements for QOC. 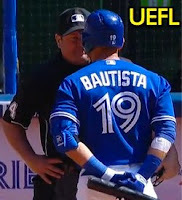 UEFL Rule 6-5-c-4 states, in part, that Quality of Correctness for a post at-bat ejection shall be judged "in relation to the holistic effect of the argued call(s)/pitch(es)." The Rule further specifies that the argued call(s) must (1) be against the ejected person or team and (2) have realistically resulted in a different outcome of the individual at bat. The Board finds both requirements have been satisfied. (1) The call of strike is plainly against the offensive team. (2) To determine whether a strike two call during a 1-1 count that ended in a swinging strikeout meets the "realistically resulted in a different outcome" criterion, the Board cites precedent in re 145 Welke 3 (2012), a nearly identical situation in that following a correctly ruled strike and ball to draw a 1-1 count, the batter took a called second strike before striking out swinging on the very next pitch. On appeal, the Decision held that Pitch #3/Strike 2 was relevant to the adjudication of QOC, finding that Rule 6-5-c did indeed apply. This principle was again affirmed in the case in re 019 Foster 1 (2012), in which a 1-2 pitch, ruled ball 2 as opposed to strike 3, was eligible for review pursuant to UEFL Rule 6-5-c after the at-bat's result adversely impacted the defense. Therefore, on the merits of stare decisis, the Board must confirm the Original Ruling. I just can't see how anyone can challenge this. The ejection was obviously because of the incorrect second strike. To me, an easy confirm. just fyi the blue jays analysts/writters all thought that the pitch was a strike. Wow, Bautista argued one correctly for once (he's what, 1 for 10 now?). I still don't understand arguing balls in strikes. I was doing a local tourney game this weekend ("elite" 9U) and some of the barking about the strike zone was insane. It really doesn't get coaches or players anywhere, so I don't understand why so many people do it - at ALL levels!